The number of butterflies visiting my neighbor’s butterfly bush, which extends into our front yard, has been increasing steadily over the past couple of weeks. Especially the number of monarchs, which is particularly exciting. Somewhere along the way, I learned about the great migration of the monarchs, but I didn’t have a full appreciation of it until I saw the NOVA special on PBS, “Journey of the Butterflies.” The documentary chronicles the incredible 2,000 mile transcontinental journey of monarchs from Canada, through the United States, down to a sanctuary in the highlands of Mexico beginning in late August and concluding in November, where they winter over. The spring migration takes place between March and June when new generations of monarchs make their way back north. Monarch tagging programs have provided a more detailed picture of the flight patterns, routes, and timing of the migration. The documentary is more than worth the 60-minute time investment for all of the natural history, the amazing cinematography, and the awe inspiring sheer volume of butterflies at the culmination of the migration. 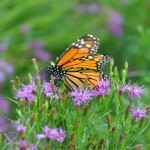 If you are in the DC metro area, sign up for monarch tagging and join us there! If you are not in the area, check with nature centers near you to see if they offer monarch tagging workshops. If not, ask them to! Have you witnessed the great migration or participated in a tagging workshop? Please tell us about it in the comments. Often people who have autism and similar challenges relate to nature more so than with other people. They also benefit from having space to run freely. Last week a young man and his mother visited Homefields in Millersville, PA. While parents talked in support of one another, the young man gleefully ran through fields of vegetables and past rows of flowers with net and butterfly cage in hand capturing monarchs to tag. This is a responsibility he participates in with others at a nature center in Delaware where he lives. He explained how every tag has a number so the butterfly can be tracked. Tagging monarchs is a fun and beautiful activity for many and, hopefully, helpful for the butterfly’s future. Thank you for this article.